The Danish Cyclists’ Federation’s “Bike to School” campaign creates thousands of new children cyclists every year. Photo: Ursula Bach, Municipality of Copenhagen. In September, the Danish Cyclists’ Federation’s campaign “Bike to School” hits Danish schools for the fifteenth year in a row. Every year, the campaign gets thousands of new children cyclists out on the school routes and thus contributes to keeping the Danish bicycle culture alive. Bike to School resulted in 5,000 brand-new cyclists last year when the campaign ran for the fourteenth time with close to 130,000 pupils from across the country. Every time it runs, the campaign makes around four percent of its participants start cycling – and this adds up to a great many cyclists over time. So, the Danish Cyclists’ Federation’s children’s campaign makes a concrete difference on the Danish school routes as shown in a thorough evaluation done by the consulting company, COWI, last year. “It means a lot to know that the work we do has such good effects. 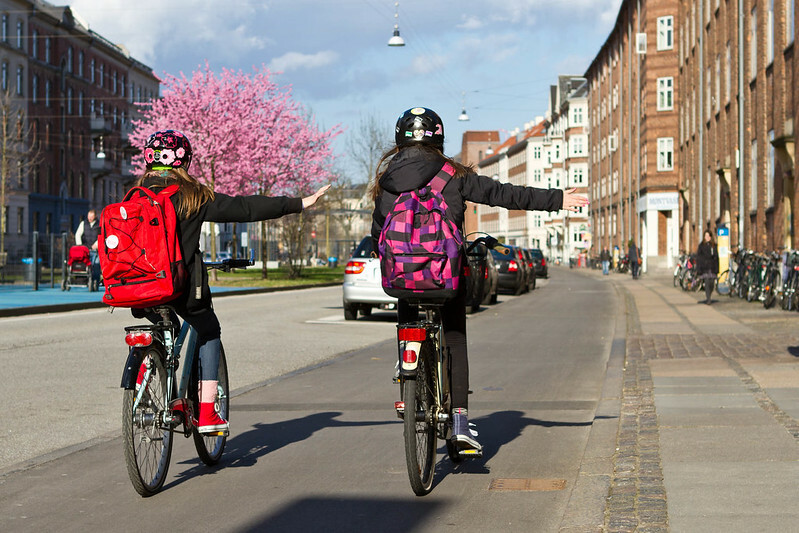 By definition, transport habits are difficult to change, but “Bike to School’s” mix of information and concrete activities really changes something,” says Maria Bech who is Head of Campaigns at the Danish Cyclists’ Federation. In other words, “Bike to School” has helped support school cycling in Denmark, an area which has been free falling through the ‘90s from close to 70% among older students to around 50% in 2000. Luckily, according to a survey that the company, Megafon, did for the Danish Cyclists’ Federation, the development has stabilized over the past five years. The survey points to the fact that soft measures like campaigns have good effect – but also that more must be done to turn things around and get more Danish children to bike again. Too far distances and unsafe school routes constitute the two most significant barriers for making more children bike to school. If these factors are to change, determined political decisions and money is required. Fortunately, both the Danish population and many politicians support children’s cycling – and the Danish Cyclists’ Federation is working hard to turn the good intentions into action. Read more about Bike to School. Read more best-pratice examples about children’s cycling in Denmark.